When rumours first started to gain momentum that after so many years, there would finally be a Simpsons movie in production, there was a lot of pressure on the producers – ‘The Simpsons’ has such a long history of subversive comedy and overall brilliance, it is beloved by most of our generation. Could they ever expand the magic of 22 minutes into a feature length film? Thankfully, The Simpsons Movie partially delivers on its promise. Little has changed for the residents of America’s most pollution-riddled town. The Springfield Lake is so toxic it claims a huge rock band within the opening sequence, the citizens still treat it as their own personal dumping site, and apart from Lisa (as usual), no-one seems to care. Upon finally getting the message that their town is bordering on killing their lake, they finally decide to act, only for Homer to (without thinking of anything other than doughnuts) condemn them all. It is obvious from the beginning that the chosen target for parody in this ‘episode’ is the environmental movement sweeping the world. The Simpsons Movie hits bullseye most often when portraying those who will close their doors to a child’s pleas about saving the planet, and goes as far as using Nelson to make the point. More obvious targets include Al Gore’s An Inconvenient Truth campaign, but placing Arnold Schwarzenegger in the White House and a millionaire businessman in charge of the Environmental Protection Agency shows the usual amount of thoughtfulness has gone into the writing. There are moments when the events on screen are more likely to make the audience laugh than The Simpsons has for many years. Immediately classic sequences like Bart’s naked skateboard dare (partially spoiled by its presence in the trailer), and particularly Homer’s invention of ‘Spider-Pig’, mean it is impossible not to fall about in hysterics. That said, there are also stretches that move a little slowly, and after the first act (which is glorious) the pace really tails off. It is almost as if the writers used up a lot of their best mental energy on the first madcap half hour, it is so stuffed full of self awareness, irony and activity. After a midsection that is a little slow moving, the family’s return to Springfield renews the fun and excitement, and the film ends with positive energy. Audiences may wish to stick around during the credits to milk all the Simpson-y goodness from the film, and they will surely be rewarded. Not only will they be introduced to the new Springfield Anthem, but other surprises, including yet another moment of self deprecation, await. 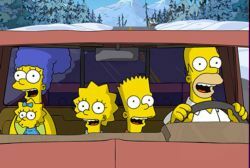 In the 20 years since they first appeared in shorts on ‘The Tracey Ullman Show’, the Simpson family have been joined by all manner of fancy animated characters and creations, and they have stayed resolutely the same, even revelling in their simplicity in the trailer for their long-awaited film (‘The Simpsons Movie… in 2-D’). In spite of the wizardry of Pixar et al in their attempts to bring human characters to life, The Simpsons still presents the most realistic collection of animated humanity going around. This entry was posted in Film Reviews and tagged Animation, Satire by Mark Lavercombe. Bookmark the permalink. So, Matt Groening and Co. have finally given us a Simpsons movie, and although it’s about 15 years too late, its arrival is by no means unwelcome. It’s certainly refreshing to see a good old-fashioned 2D cartoon (albeit assisted by computers) amongst all the CGI we’ve had since Toy Story. Even so, it’s hard to argue the need to see this film on the big screen. Thankfully it doesn’t feel like 3 Simpsons episodes tacked together, more like one extra long episode. It isn’t as good as the series’ peak (somewhere around and after season 5, so say I), yet it is significantly wittier than the last few seasons. Some old-school fans used to lament Homer’s fall from flawed to completely dim-witted, and this certainly hasn’t been reversed. These days it’s impossible to imagine Homer even having the intellectual capacity to try and impress his boss with his family at the workers’ picnic. Thankfully the emphasis is on the immediate family, rather than trying to include every character. That being said, just about everybody makes an appearance, and it’s astounding just how many regulars there are in Springfield these days. I can’t think of any TV show that has a larger cast. Whilst the jokes come thick and fast, the only disappointment is that it relies more on slapstick humour than satire or biting social commentary. There are inklings of something like this, but perhaps no more than the usual 20-odd minute episode, thus the tone feels a little more immature over 85 minutes. 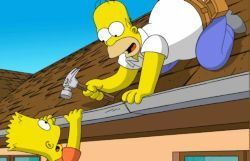 As it stands, The Simpsons Movie isn’t a return to peak form, nor an embarrassment, but an entertaining romp featuring some of the most familiar characters ever to grace the small screen.